At first glance, it looked much like any other class at Sam Houston State University. A distinguished professor-led an in-depth classroom discussion, facilitating comments among the 35 or so students assembled for a typical 75-minute class session. A keen observer, however, might have noted that the students were dressed in business attire, that the teaching style was exclusively the Socratic Method, and that all the students had read. What was going on was a “Mock Law Class,” a unique partnership between the Center For Law, Engagement, And Politics and the South Texas College of Law in which pre-law students had the opportunity to participate in a simulated law class. The class was taught by Professor Val Ricks, whose qualifications include a Juris Doctorate from Brigham Young University’s J. Reuben Clark’s Law School, time as an associate attorney with Kirton & McConkie, and 18 years teaching at South Texas College of Law, including five years as the Vinson & Elkins Research Professor of Law. The preparation for the class involved in-depth readings of three legal cases and the knowledge that the class would be fully participatory—there were no “passes” given when called upon. To participate, students were required to sign up for the class in advance and agree to read the original court opinions issued by the courts. The result was some dense reading, the expectation of being called upon and pressed for answers, and a bit of trepidation heading into the classroom, according to participants. SHSU senior Daylene Moreno agreed. The idea behind the class is to help prepare SHSU students for law school or for making the decision about law school, according to LEAP Center director Mike Yawn. “There are so many uncertainties about post-graduate education, particularly law school, it’s important to give students a realistic view of what the experience is and allow them to use that information to make good decisions,” he said. In recent years, many SHSU students have made the decision to apply to law school; in fact, the Law School Admissions Council now ranks SHSU as a top “law-school feeder,” meaning that it is among the top 6 percent of the nation’s universities at producing law-school applicants. Last year, for example, 97 SHSU students applied to law school, with 60 being accepted to one or more law schools at such universities as Baylor, University of Colorado, University of Houston, Indiana University, Loyola, Penn State, University of Minnesota, Syracuse, SMU, University of Texas and South Texas College of Law, according to Yawn. In all, SHSU students applied to 92 different law schools last year, and South Texas College of Law was the one most applied to, with 45 different SHSU students applying there. 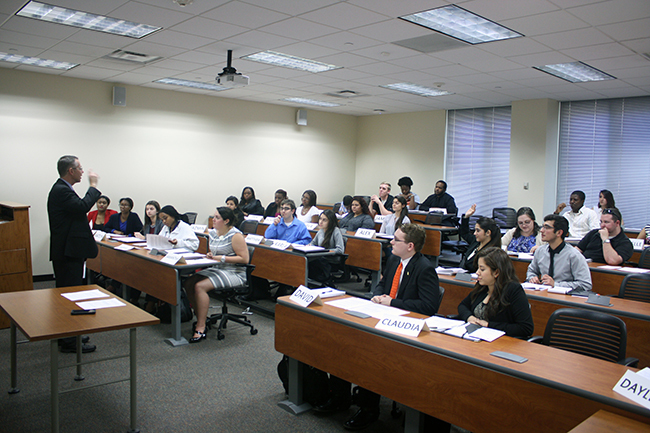 The Mock Law Class is one of several activities that the LEAP Center offers to help pre-law students. This spring, the LEAP Center has partnered with Kaplan to offer a Mock LSAT, worked with other law schools to provide informational sessions, and brought in several practicing attorneys to meet with students. On April 1, the center will host the 10th Court of Appeals, which will hear oral arguments in four separate cases, and on April 14, the center will host a presentation by Michael Morton, whose wrongful conviction in 1987 and subsequent 25 year imprisonment resulted in the Texas Legislature’s Michael Morton Act, which changed the rules of the discovery process. The center’s programs also extend to all academic disciplines. “Our goal is to expose students to diverse learning opportunities across all fields,” Yawn said. To that end, earlier this semester LEAP Center students lunched with assistant secretary of state Roberta Jacobson, attended the governor’s inauguration in Austin, and have worked regularly with local non-profits. Later this semester, the center will host a non-profit roundtable, a student workshop on “Paths to Public Service,” and will partner with the Huntsville Public Library to offer a “Citizenship Preparatory Course” to local immigrants who wish to earn their citizenship. For more information about the LEAP Center, Yawn at mike.yawn@shsu.edu or 936.294.1456.